Disney animators and filmmakers have again expanded the boundaries of imagination with Fantasia 2000. Fulfilling Walt Disney's original vision of uniquely fusing sight and sound in a full-length motion picture, this film begins where it predessor, Fantasia left off, with seven completely new segments and the return of the popular "The Sorcerer's Apprentice." In this fun-filled movie, breathtaking images are coupled with classical music favorites. From Beethoven to Gershwin - from flamingos bobbing yo-yos to a city in bluesy motion - vivid animation brings the music of the masters to colorful life. Sixty years after the original masterpiece, Roy E. Disney has orchestrated a brilliant collaboration of more than 1,200 artists and technicians - including the animators of The Lion King, Beauty And The Beast and Aladdin - to present Fantasia 2000, a film filled with "dazzling moments" (The New York Times) and arguably the greatest Disney film ever" (KNX-CBS Radio), that is sure to captivate viewers of all ages! Cast: Hosted by Deems Taylor, Steve Martin, Quincy Jones, Bette Midler, Penn & Teller, James Levine, James Earl Jones, Angela Lansbury. Box Office: Budget: $80 million. Opening Weekend: $2.911 million (1313 screens). Gross: $58.333 million. DVD: Widescreen 1.85:1/16x9; audio English DD & DTS 5.1, French DD 5.1; THX; subtitles none; closed-captioned; 17 chapters; rated G; 74 min. ; $29.99; street date 11/14/00. Supplements: Audio Commentary by Executive Producer Roy E. Disney, Conductor James Levine and Producer Don Ernst; Audio Commentary by Segment Directors and Art Directors; "The Making of Fantasia 2000" Featurette; Animated Short "Adventures In Music: Melody"; Academy Award Winning Animated Short, "Toot, Whistle, Plunk and Boom"; Showcase Program Featuring Exciting Clips From Fantasia 2000! ; THX-Certified, Including THX Optimode. Despite my mixed feelings about the original 1940 version of Fantasia, I felt excited to see the new update, Fantasia 2000. Over the last couple of years, I’ve become a big Disney fan, and though I still don’t think much of the first film, I always look forward to new Disney animation releases, and F2K was no exception, especially since it featured the additional enticement of the giant IMAX system. It took me a couple of months after its January 1 2000 debut to view the film - no IMAX screens are very convenient, and I’m an awfully lazy person - but I finally saw F2K at a most appropriate time: during a brief visit to Orlando in early March. I plopped down my $12 - stupid expensive IMAX movies! - and prepared for a fine experience. Or so I hoped. Ultimately, I found my initial screening of F2K to be a bit of a disappointment. While I felt it had its moments - I particularly enjoyed the “Pomp and Circumstance” segment that starred Donald Duck - the piece as a whole felt a little slow and drab. Nothing about it seemed particularly faulty, and it certainly lacked the lows of the original Fantasia, but little about F2K excited me. Now that I’ve seen it a second time, however, I find myself with a slightly different viewpoint. While F2K will never compete with classics like Pinocchio and Lady and the Tramp or newer hits like Toy Story 2 or A Bug’s Life in my consideration of Disney’s all-time best, I thought it was a generally well-executed and entertaining film that I enjoyed much more than I did the first film. I believe a lot of my preference has to do with lengths; F2K runs about 50 minutes shorter than its predecessor. Since my main issue with the original Fantasia concerns the boredom I often feel during its more tedious moments, the abbreviated length of F2K does a lot to remedy those issues. The faster pace serves the material well and makes the movie much more palatable; I never felt bogged down in any particular segment. It helps that all of the eight shorts are fairly enjoyable. Seven of these are new, while one - “The Sorcerer’s Apprentice” - comes from the 1940 original. Walt Disney envisioned Fantasia as a perpetual “work in progress”; every few years, some new segments would appear and others would leave, and the ultimate piece would never truly be completed. Obviously that didn’t happen - 60 years is a long time between segments - but the inclusion of “TSA” offers a nod to that concept. “Pomp and Circumstance” remains my favorite of F2K’s shorts. This light-hearted telling of the story of Noah’s Ark provides a nice revival for the Duck and offers the film’s most deftly comic moments. The original Fantasia also suffered from excessive dryness, but the new movie seems determined to avoid that fate; the humor remains gentle and it doesn’t go goofy - or feature Goofy - but it felt more light-hearted than the self-serious original. Somewhat surprisingly, my second-favorite short is probably “Pines of Rome”. This fantasy piece features flying whales and works harder to create a mood than to tell a story. The visuals seemed striking and blended well with the music, and I found it to be a nicely-evocative program. Another surprise stemmed from my enjoyment of the abstract visual interpretation of Beethoven’s “Fifth Symphony”. Probably my least-favorite sequence in the original Fantasia was the tedious and pedantic opening bit, Bach’s “Toccata and Fugue in D Minor”. Beethoven’s “Fifth” attempts to replicate that segment’s tone but creates a much more compelling piece; the visuals are bold and exciting and complement the music well. Probably my least-favorite program was the one based on George Gershwin’s “Rhapsody in Blue”. It integrates the cartoon styles of Al Hirschfeld and creates a little tale of a few unhappy lives in the Big Apple. Overall it’s a mildly interesting piece, but it felt a little too forced and self-conscious for my liking. However, if that’s the worst Fantasia 2000 has to offer, I’ll take it; the film’s lowest lows still rise far above the depths witnessed in 1940’s Fantasia and the piece holds together nicely as a whole. F2K will never be one of my favorite Disney animated movies, but I definitely will be happy to watch it again. And don’t forget to stay all the way until the end of the picture; there’s a fun surprise that awaits those who do so. 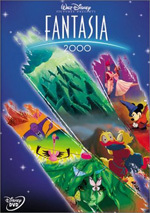 Fantasia 2000 appears in an aspect ratio of approximately 1.85:1 on this single-sided, double-layered DVD; the image has been enhanced for 16X9 televisions. In regard to the aspect ratio, some controversy surrounds it. That’s because of its IMAX screenings. Although I found it impossible to obtain definitive data, it appears that IMAX movies generally use dimensions of 1.44:1, and some feel that this must mean that the general theatrical release of F2K cropped the image to achieve the 1.85:1 ratio. From what I understand, this wasn’t the case. Allegedly F2K was always meant to be show at 1.85:1, and changes were made to allow for the IMAX dimensions. Does this mean that there was additional animation completed for the IMAX version and it essentially represents an “unmatted” rendition of the film, or does this mean that the IMAX edition cropped the sides of the 1.85:1 image? I have no clue, and my attempts to find a definitive answer to this question came up empty; I located lots of different opinions but nothing I’d call certain. In any case, I thought that the framing on the DVD looked appropriate. The only odd occasion occurred during “The Sorcerer’s Apprentice”. This part of the original Fantasia was shot in a 1.37:1 aspect ratio, which almost exactly replicates the dimensions of a standard 4X3 TV. However, apparently because of the DVD’s anamorphic enhancement, “TSA” is windowboxed for this image; that means there are black bars on all four sides of the cartoon. Frankly, this made little difference to me; I thought it’d be annoying but I barely noticed the bars. Overall, F2K presented a nearly-flawless picture with the exception of “The Sorcerer’s Apprentice”; the following comments will apply to all sections of the movie other than “TSA”, which I’ll discuss in a separate paragraph. Sharpness appeared quite crisp and concise throughout the film. At no time did I discern any signs of softness or fuzziness; the movie looked detailed and well-defined. Moiré effects presented no problems, but I saw a few minor jagged edges during the “Rhapsody in Blue” segment. That short also presented the most severe artifacts from the anamorphic downconversion on my 4X3 TV, but these concerns remained minor. No print flaws were observed; the film lacked grit, grain, scratches, blotches, hairs or other defects. Colors appeared nicely varied and clear. Due to the variety of subjects, the shorts used quite a few different hues, and the DVD replicated these wonderfully. From the pastels of “Rhapsody” to the broad pinks of “Carnival of the Animals” to the rich blues of “Pines of Rome”, the colors were accurate and bold. Black levels seemed terrifically deep and rich, and shadow detail was appropriately dense but never excessively thick. For the most part, “The Sorcerer’s Apprentice” kept pace with the appearance of the other shorts, but it showed its age to a small degree. Actually, the small screen hid most of the flaws; when I saw F2K on an IMAX screen, the defects looked much more noticeable. On my TV, I detected some light grain, and a few shots appeared slightly soft, but otherwise “TSA” fit in nicely here. I’m sure the flaws are still there, but since the image has shrunk radically, I couldn’t see them nearly as readily. “TSA” also stood out sonically, as its dynamics paled beside those of the newer shorts. However, I’ll save those remarks for the end of this section of the review, as I’d rather discuss the overall quality of the soundtracks and then relate the differences heard in “TSA”. Yes, I meant to write “soundtracks” since F2K offers both Dolby Digital 5.1 and DTS 5.1 mixes. As is often the case, I preferred the DTS edition, although the differences are not enormous. Anyway, I’ll detail my reactions to the DTS track first and then summarize the ways in which I felt the DD mix differed from it. Although F2K contains some speech and effects during the interstitials - the live-action sections between cartoons - the score is the main attraction, and the DTS edition offered some of the clearest and most stunning music I’ve heard on a DVD. The soundfield displayed the audio actively from all five channels. Not surprisingly, the music sticks most strongly to the forward speakers, but the surrounds also support the score to a terrific degree; I felt wonderfully engulfed by the songs. There wasn’t a whole lot of discrete instrumentation in the rear, but it occurred enough to make the stereo nature of the surrounds truly worthwhile, and the very involving nature of the soundfield created an immensely affecting package. All of this was bolstered by the terrific quality of the track. The music seemed very crisp and clear at all times, with wonderfully distinct and easily-distinguishable instrumentation throughout the film. From quiet moments like solo piano parts of “Rhapsody in Blue” to the many strong and loud bits, the various components came through brilliantly. I found the track to display fantastic dynamic range with some exceedingly deep low end; the bass really packed a powerful punch and reinforced the dynamics. It’s about as good as you’re likely to hear classical music sound in a movie. How did the Dolby Digital mix compare? Fairly well, though I thought it appeared slightly less powerful. The DD track seemed to lack the same dynamic range as the DTS version; some highs appeared a little “clipped” and the bass - though quite strong - just didn’t match up with the house-rocking lows of the DTS mix. However, these distinctions were really fairly minor and only appeared really noticeable when I made direct “A-B” comparisons between the two tracks. As I noted earlier, the audio for “The Sorcerer’s Apprentice” came across as significantly weaker than the sound for the rest of the film. Since it was recorded about 60 years earlier, that wasn’t a surprise. Actually, the music appeared very clear and bright for a track its age, but it still couldn’t match up with the other songs. The imaging was much more forward-oriented, and it tended to display gimmicky stereo effects which lacked the true blending of a more accomplished. Dynamics were pretty weak - though a little low-end appeared at times - and I noted some mild distortion. Honestly, I’m not really complaining about the sound quality of this segment; it was excellent for material of its vintage. However, I did want to distinguish its tone from that of the rest of this fantastic-sounding mix, since it sticks out from the pack. Fantasia 2000 includes a nice complement of supplements, starting with two separate audio commentaries. The first comes from executive producer - and Walt’s nephew - Roy E. Disney, conductor James Levine, and producer Don Ernst. All three men were recorded together; the track even places them in discrete spatial locations, with Ernst on the left, Levine on the right, and Disney right in the middle. Although the commentary suffered from some of the “happy talk” tendencies that mar many of these productions - it can be hard to find tracks that include critical discussions - I thought it provided a solid general look at the history of the production. The men touch on a nice variety of subjects, from the way F2K came into being to a number of small points about each different short. We get a good mix of facts and anecdotes, and it’s all presented in an engagingly genial manner. I would have liked more information about the obstacles the production faced, but nonetheless I enjoyed this track. Also very interesting was the second commentary, which involved a wide variety of participants. This one featured the directors and art directors for each of the different segments. As such, the commentators change every few minutes, though some make reappearances; actually, Don Hahn and Pixote Hunt - who created the film’s interstitials - almost become our running companions for the movie, plus Disney and a few others recur. Not surprisingly, the second commentary provided a more detailed “nuts and bolts” look at the making of the film. The participants let us know what they wanted to do with the material and how specifically they created the work. This may sound dry and technical, but it’s really not, and the information came across in a compelling manner. In addition to the animators, this track included a few guests. During the “Rhapsody in Blue” segment, cartoonist Al Hirschfeld - whose work inspired that piece’s look - sits in with directors Eric and Susan Goldberg. More interestingly, the commentary for “The Sorcerer’s Apprentice” features Roy Disney and Mickey Mouse, and Donald Duck butts in on the conversation between Francis Glebas and Dan Cooper. Surprisingly, these cutesy touches work nicely and add a nice light touch to a solid commentary. One extra confronts you as soon as the DVD starts. We find a three and a half minute “Introduction” from Roy Disney. You can also access this from the “Bonus Materials” menu, but I doubt you’ll want to do so; it’s a nice way to start the DVD, but it doesn’t provide a lot of repeat-viewing interest. Much more compelling is “The Making of Fantasia 2000”, a 48-minute and 35-second program about the film. Hosted by Disney semi-regular David Ogden Stiers (Beauty and the Beast, Pocahontas), the show provides a solid little overview of the movie’s creation. We find a combination of interviews from filmmakers and Disney executives plus animation historian John Culhane mixed with film clips and a lot of good shots from behind the scenes. The film’s main genesis is discussed, and some specifics about each segment appear. All in all, it’s a solid program that gives a good general depiction of the making of F2K. An odd compendium of F2K clips appears as a “Showcase Program”. This five minute and 25 second program features snippets of different parts of the film. I’d find this to be a nice addition to a different DVD, perhaps, but it seems odd here since we already have the whole movie at our disposal. In any case, it doesn’t hurt to have it, so I won’t complain too much about it. Much more gratifying are the additional short cartoons available on F2K. We get two pieces from 1953: the 10 minute and 10 second “Adventures In Music: Melody” and the 10 minute and 15 second “Toot, Whistle, Plunk and Boom”. Both were ground-breaking shorts. “Melody” was Disney’s first attempt at 3-D animation, while “Toot” offered their initial stab at Cinemascope cartoons. Both also star Professor Owl, who would never be heard from again. These cartoons were part of a planned series about music that never quite got off the ground. This may be because neither was terribly interesting. Oh, I thought they had some charms, but I really disliked the grating Professor, and other than Bertie Birdbrain, I didn’t much care for the roster of students either. Still, these seminal cartoons make an interesting addition to the DVD. As first seen on the Fight Club DVD - and also available with Terminator 2 “Ultimate Edition”, the Toy Story movies and a number of Anchor Bay DVDs - Fantasia 2000 includes the "THX Optimode" program to set up your TV. This provides you with information to correctly configure various audio and video aspects of your home theater. I don't think it fully replaces something like Video Essentials, but then again, "Optimode" comes as a free addition to a DVD, so it's clearly a bargain. If you haven't already used VE or some similar product, you should find "Optimode" very helpful. Lastly, F2K includes a "commemorative booklet". It's a nice little package that features some notes about the movie and the music and also provides cool "Just for Fun" elements aimed at kids. The latter were especially good as they were more educational than usual; they encourage kids to flex their artistic muscles and seemed like rather positive exercises. I thought the DVD's lack of trailers seemed odd; perhaps the "Showcase" replaces those ads - which do make on appearance on the "Fantasia Anthology's" third DVD - but it was strange not to get them here. Despite that omission, Fantasia 2000 made for a terrific package. The film itself offered an improvement on the overrated original by avoiding its slow-paced pitfalls; while I can't call the modern effort a classic, I thought it was generally fun and well-executed. The DVD itself is a top-notch piece of work. The picture and sound are both extremely clear and strong, and the supplements add a lot of extra value. Fantasia 2000 is a fine DVD that merits your attention. Note: Fantasia 2000 can be purchased either on its own or as part of a 3-DVD package called “The Fantasia Anthology”. The latter also includes the original Fantasia plus a third disc with a slew of supplemental materials about both films. Unlike the DVDs in the “Ultimate Toy Box”, the F2K disc available individually does not differ from the one found in the “Anthology”, so if you only want F2K, rest assured you won’t lose out on any goodies. However, if you plan to buy both movies and you enjoy extras, the “Anthology” is the way to go; it lists for only $10 more than the two separate DVDs and features a lot of additional materials.